The perforated bags are suitable for packaging fresh baked food and vegetables. These bags have holes that allow the product to breath, enhancing the shelf life of the products. Our perforated bags are made from biodegradable cast polypropylene films that are flexible and strong. 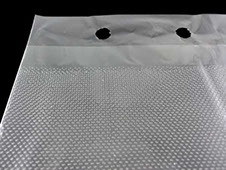 Perforated bags can also be used for packing materials which are hot while packing such as cement. We can custom make woven polypropylene laminated gusseted bags as required by the customer, with or without multi-color printing.